Last updated on August 15, 2018 by Jill // Products & Reviews. I hope this post provides everything you need to figure out the best option for you for keeping squirrels out of your bird feeder! It is a comprehensive guide that covers a lot of options – all based on our personal experience and research. So, I watched my husband get involved in a battle he thought he could easily win – and although I found it incredibly amusing, he did not exactly feel the same way! They dueled daily – it was a combat of will and brains – and I hate to say it but the squirrel was winning, and by a large margin. My husband did not give up though! At least he is not afraid of squirrels though like this guy who felt the need to call the police because he was being chased by a squirrel! We had a pretty good laugh at that one! Every day seemed to bring a new experiment in getting the squirrels to stop monopolizing the bird feeders and keep our rescue dog Cleo from engaging in a chase. In an effort to keep the squirrels from becoming her play toy, we really wanted to do what we could to keep them out of our yard without sacrificing our love of watching birds! We learned so much during this drama filled time I figured I might as well share what we learned – what worked, what didn’t and our recommendations for helping make your life squirrel-less! Our personal findings = there is no 100% squirrel proof option out there! Sorry, but that is the truth. So – Who Won In The Squirrel versus Husband Battle? My husband had several battles with the squirrels – I will outline them below and let you know who won each battle. Slip and Slide: He tried butter and oil on the stake in the ground that held the feeders. The squirrels won – they slid – a lot, but eventually slid enough that the oils wore off and they were able to climb it with easy. Clearly squirrels are persistent little buggers – if anything I think my husband learned a lesson from them on this one. #dontgiveup Husband – 0. Squirrel – 1. Squirrel Baffle: This was a shining moment that made him uber excited – he swore he got it this time. A squirrel baffle! That was the ticket. Only the squirrel had no problem getting around the baffle and get his reward for being a smart squirrel. In his defense he may have purchased the WRONG baffle (neither of us can remember which one he purchased originally but we have since purchased one that we have had some success with and recommend below) as some are better than others or he may have not put it high enough – but either way, the squirrel won this round. Husband – 0. Squirrel – 2. Hot Sauce: So this was a highly recommended tactic – which went horribly wrong for the hubby. He mixed the bird seed with the hot sauce – with his bare hands. He did not think to use gloves – and when taking a hot shower later in the day, the steam opened his pours and the hot sauce seeped in. His skin was burning for days. Oh, and to top it off it did not work – the squirrels still managed to find the seeds that he was not able to fully encase in hot sauce. Husband – 0. Squirrel – 3. Bird Seed: So the man found another great option – bird seed that squirrels hate. He found Cole’s Blazing Hot Bird Seed and saw some great reviews so he tried it and was thrilled that it actually worked without him having to ever touch hot sauce again, but it only worked a bit. We definitely saw a reduction in the amount of squirrels, but it did not get rid of them all. Giving a tie breaker on this one! Husband – 1. Squirrel – 3. So, at this point he decided to put the battle aside – but he of course never admitted defeat! We moved on to doing some research to find a great bird feeder that would be difficult for squirrels to eat from and below is what we found and are considering trying. At the time we only had bird feeders that hung on poles – but we were open to all options at this point. We just wanted to be able to watch birds — not squirrels! Below are the bird feeders that we have found to do the best job at being squirrel resistant – in the order of how well they work. The research we did validated that these feeders do in fact work and we actually chose to go with the Squirrel Buster Classic for our own front yard – although we wish we had went with the plus for the Cardinal ring! There are a few other feeders out there that say they are squirrel proof but we do not recommend them – some we found too many videos of squirrels eating the food and some even had people reporting that birds were being injured by the feeders. So only the 2 below are the ones we can safely and confidently recommend. Without a doubt one of the best options for keeping squirrels away from your bird food! Brome is a leader in the bird feeder world and they knock it out of the park with this feeder! The Brome 1024 Squirrel Buster Plus bird feeder with its free cardinal perch ring is our top pick for squirrel proof bird feeders – and you can see why below! Size: 6″ x 6″ x 28″. Ports: 6 feeding stations for birds. Auto Closing Food Ports: The ports or holes where the seeds are dispersed automatically close when the weight of a squirrel is placed on the shroud, this is what makes this bird feeder the top choice in our roundup. Adjustable Weight: You can adjust the tensions of the trigger spring that controls the openings so you can prevent unwanted visits from larger birds or other critters. Chew proof: Squirrels can try but they will not chew their way through to the food like they can with some cheaper bird feeders. Ventilation: The feeder uses a patented seed ventilation system which keeps the feed fresher than other feeders by letting hot air and humidity escape through vents at the top of the feeder. Dishwasher safe: Keeping it clean is important to keeping the birds healthy so the fact that it is easy to put in the dishwasher is a great bonus. Cardinal Ring: Because cardinals have bigger feet and like to grip bigger purchases – the Brome Squirrel Buster Plus even provides a ring just for them! Brome manufacturers several variations of the Squirrel Buster Plus if you are looking for something a little less expensive or smaller in size. 1. Squirrel Buster Legacy: This option measures 5.5″ x 5.5″ x 24″ and offers 4 feeding stations and holds 2.6 pounds of seed and offers the same features as its larger counterpart excluding the cardinal ring. 2. Squirrel Buster Standard: This option measures 5.5″ x 5.5″ x 21.5″ and offers 4 feeding stations and holds 1.3 pounds of seed and offers the same features as its larger counterpart excluding the cardinal ring. One of the selling points for this feeder is their lifetime guarantee. They will replace and or service your bird feeder for as long as you own it. This makes the higher cost a little easier to understand – a quality product that is backed 100% by the manufacturer is hard to find. This video says it all! When you get to 3:33 in the video you will see exactly what happens when the squirrel tries to get his hands on the goods. The Droll Yankee Flipper is another well reviewed bird feeder that does a great job of removing squirrels. What it gets extra points for is the “fun factor” it gives in watching the squirrels get thrown from the feeder! (We promise no squirrels are hurt with this feeder). The weight activated perch will begin to spin when squirrels land on it which will then throw them from the feeder. The perch is activated by the weight of the squirrel and then the motor will engage to begin the spinning action that will gently remove them from the perch. While we personally do not want to use a battery operated bird feeder – this is a fantastic option for those that have a much bigger problem than we have. Most report nothing but positive things about this feeder. There are a few issues related to how long the battery lasts – but overall the sentiment on all the websites we reviewed were very good – and of course entertaining! A little giggle and chance for you to see just how this bird feeder works! Squirrels are not hurt – maybe a bit hungry and a little embarrassed, but they are just fine! 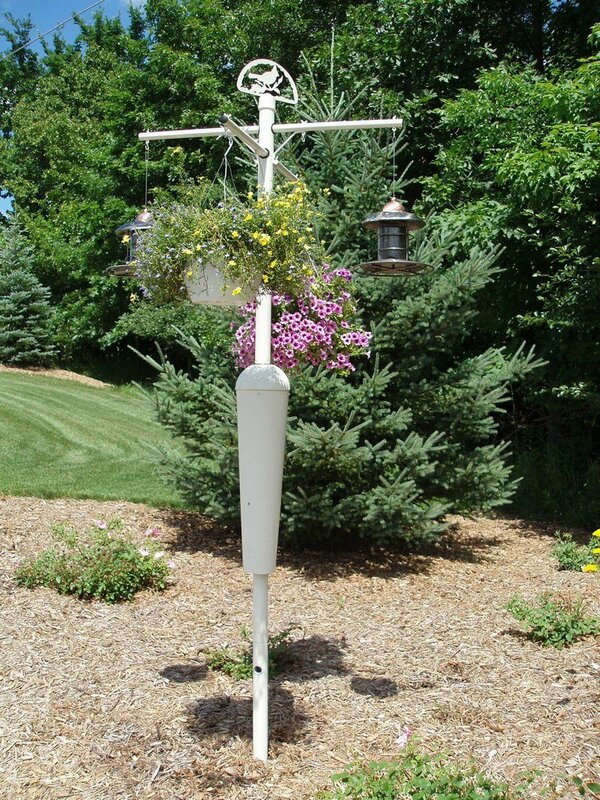 If you do not have a pole to hang your bird feeder from and want one that will help prevent squirrels from stealing the food, then we highly recommend the below for your yard. Not only is it a beautiful addition to any yard, it is a winner when it comes to keeping the squirrels from the food! Not only is this bird feeder pole gorgeous – it has been proven to work by many customers who use it and have reported that the squirrels do in fact not make it to the feeder! The 16 gauge steel pole is about 2″ in diameter and offers 4 separate arms to hang bird feeders, plants or any other accent you may want to add to your yard. The baffle: The magic to keeping the squirrels away from the feeder lies in the baffle that is inverted on the pole and is spring-loaded allowing the baffle to easily move around. For best results it is recommended to be at least 8 feet from any trees. The manufacturer has made a guarantee that even the smartest squirrels won’t get to the feeders that may hang on it. The 5 star reviews we are seeing give us 100% confidence that this is a great addition to your yard! A squirrel baffle is a uniquely designed product that will help deter squirrels (as well as other smaller critters) from gaining access to bird feeders. They are normally placed on a pole that will hold a bird feeder and are put at a level that squirrels typically cannot jump to. Sometimes yes. Sometimes no. Just like people, not all squirrels are the same – some will give up quick others are persistent as all heck and will keep trying until they make their dreams happen. The thing about the baffles is that you still need to make sure they are high enough so that the squirrel cannot just jump onto the top of it. You also need to make sure it is not near anything they can jump from – like chairs or trees. The best squirrel baffles for bird feeders. Squirrel baffles are probably the least stressful most effective way to hinder the squirrels ability to get to the bird feeder. We did try a baffle during our attempts, but do think we did not put it high enough to get the results we wanted and will revisit this option for our own yard. The Woodlink squirrel baffle is made from textured powder-coated steel and is super easy to install to your bird feeder pole. There is a coupler that allows you to install the baffler on any pole from 1/2″ to 1 3/8″. Simply snap the seem together and you have a squirrel proof experience for your bird feeder! The manufacturer recommends a placement of the baffler of about 4-5′ above ground, but we have seen squirrels jump higher than that so we would suggest making the baffler as close to the top of the pole as you can! 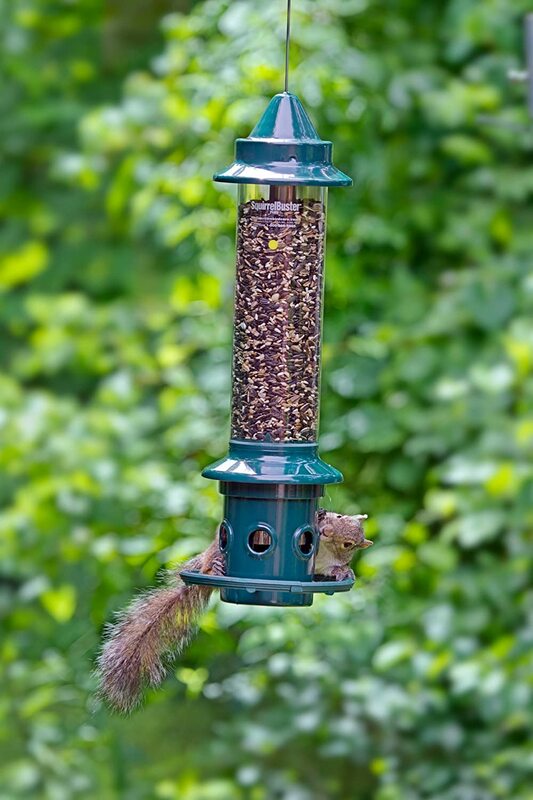 The Woodlink Torpedo Baffle is another winning option for your bird feeder pole to keep the squirrels away! The steel baffle is shaped like a torpedo and the wider opening will sit at the bottom and the shorter portion at the top on the pol. It is 6″ in diameter and can fit on any pole from 1/2″ to 1 3/8″ in diameter. The included coupler will allow you to easily mount the baffle below the bird feeder. Simple slip off the feeder – slide on the torpedo baffle and attach tot he included clamp and make sure it sits 4-5′ from the ground for the best squirrel deterrent abilities. The reviews and feedback on this have been amazing — there were a few mentions of squirrels outsmarting the baffle – but it could be do to poor set-up, location or other reasons. Here is a video showcasing the battle between squirrel and a random baffle in case you want a little entertainment! Although not specifically made to keep squirrels out of the bird feeders – we thought it was important to share some other options to keep squirrels away from those bird feeders! These were the things my husband tried originally in an effort to not spend money. We should have just spent the money first on the right bird feeder to save the aggravation! But for those that are trying to save a few pennies – these options can work to keep those pesky squirrels out of other areas of your yard! Cider vinegar is a great natural deterrent to keep the squirrels away. Soak a cloth in the vinegar and place it around any bird feeders. If you have one hanging on a tree like we do then try placing it on the top of the bird feeder to keep those squirrels from stealing the food! Because they are so fearful of predators – animal urine can help keep squirrels out of your yard. When they smell an odor that may indicate another animal is close-by, they may decide to take their hunger elsewhere in order to keep themselves safe. There are sprays and granules that are available to put around your home which may keep those pesky squirrels away. We have seen a lot of mixed reviews on whether this works or not – but most of these products are affordable and may be worth trying! So apparently squirrels hate the smell of mothballs as much as I do. Place a few mothballs in any area where squirrels are giving you grief and you should see them begin to avoid those areas. Think about the base of bird feeders – maybe a few at the bottom to help deter them! You do have to replace these frequently – and of course you do not want to place them in any areas where you want to hang out because, well – they smell gross! So squirrels are not big fans of the odor that a skunk has – so this is a great opportunity to add to your garden or bird-feeding area a unique plant that emits a skunk-like odor. The Crown Imperial is a plant that can be purchased at most local garden centers and comes in several varieties. Some have reported keeping squirrels away for up to several feet in distance. There are some spices that you may have lying around your home that will make a great natural repellent to squirrel proof your bird feeding areas as well as gardens and home interiors. Try putting cayenne pepper or red pepper flakes in with your bird seed – this should deter the squirrels while keeping the birds happy! So – we did try this one – well my husband did. And with his bare hands he added some Cholula’s hot sauce to the food and mixed it all up with his hands and then poured it into the feeder – we won’t talk about the aftermath of pain he felt when the steam from the shower opened his pours and let all the hot sauce in! But – this was the one thing that seemed to diminish the squirrel population from using our yard as a restaurant. There were still a few but they were definitely not as overwhelming. We did try Cole’s Flaming Squirrel Sauce after our Cholula’s attempt and it worked just as well. There are actually a few bird seeds that squirrels do tend to avoid so they may be an option for you if the squirrel infestation is overwhelming! There are also some bird feed blends specifically created to keep the squirrels away. One we personally had some success with was Cole’s Blazing Hot Blend Bird Seed which keeps the squirrels away with its hot habanaro chili additives. While it did not keep every squirrel away – it definitely lessened the amount of squirrels that we had! Well – in my opinion, they tied. Ultimately, because I am clearly an animal lover (as you can tell from this blog!) and actually embrace the squirrels – we decided to give the squirrels a separate feeder that we placed on the outside of our fencing in our backyard. This keeps our dog from going after them and keeps the birds pretty darn happy in not having to do battle with the squirrels for food. And my husband made me happy by letting me still enjoy ALL the nature in my yard – even if from a distance! Our backyard bird feeders do hang from our tree – we have one on each side of it and we do use the seeds that squirrels tend to not like as much as well. So by giving the squirrels what they want and making the bird feed less appealing, we have found a “happy” place in our yard for everyone! We actually invested in the Squirrel Buster Classic version and have to say it was worth every penny! We had to adjust the spring a few times to get it just right ….. but the squirrels have definitely given up trying to get food from it. We are enjoying our yard again to the sound of chirping birds and the lack of me screaming “Cleo leave the squirrels alone!”! For the front yard we did in fact purchase the Squirrel Stopper Deluxe System and are thrilled with our purchase. We can now enjoy sitting on our front porch and watching the birds in peace. We have yet to see a squirrel on the feeders – not saying they do not get there – we use our back yard more often, but to date – we have seen no squirrels on the 2 bird feeders that hang from the pole set. I love how we can hang some pretty flowers along side the feeders – it is practical but also beautiful in our front yard. Thanks Tom! I have never heard of that one before. I am going to have my husband test it here and see what happens! I am glad you found a solution!